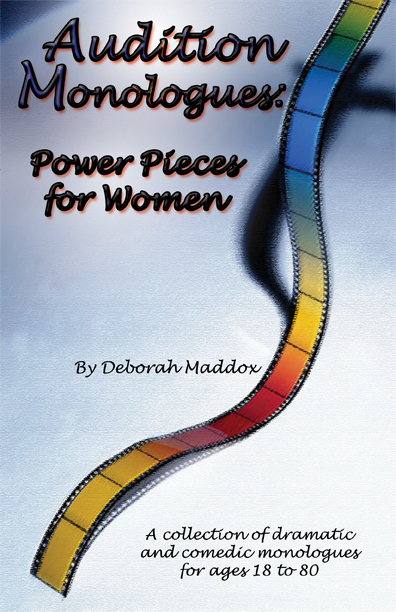 Audition Monologues: Power Pieces for Women is an extremely insightful resource of to any actor from the ages of 18 to 80+. The monologues are expressively written in first person, enabling the actor to become the character in the present moment and project in the most effective way. You will find her in this book. Although she is under full supervision of a psychiatric doctor, she stills feels scared and alone. There seems no way out of her madness and the voices won’t stop talking in her head. She is at the funeral home making arrangements when she escapes the present moment and fondly remembers her life with her husband. She has watched her daughter go through a tragic experience. Picking up the pieces has not been easy. These are a mother’s words of encouragement. A drug addict sends her boyfriend out to purchase a quick fix only to find out that he is as much of a junky as she is. Maybe it was when she saw her last boyfriend smell the arm pit area of his shirts to decide what he was going to wear for the day. She may feel that keeping a secret is one of her strengths. However, gossip is her biggest weakness. This devoted housewife is no dummy. When her husband steps out of line, he pays the consequences in the most peculiar ways.